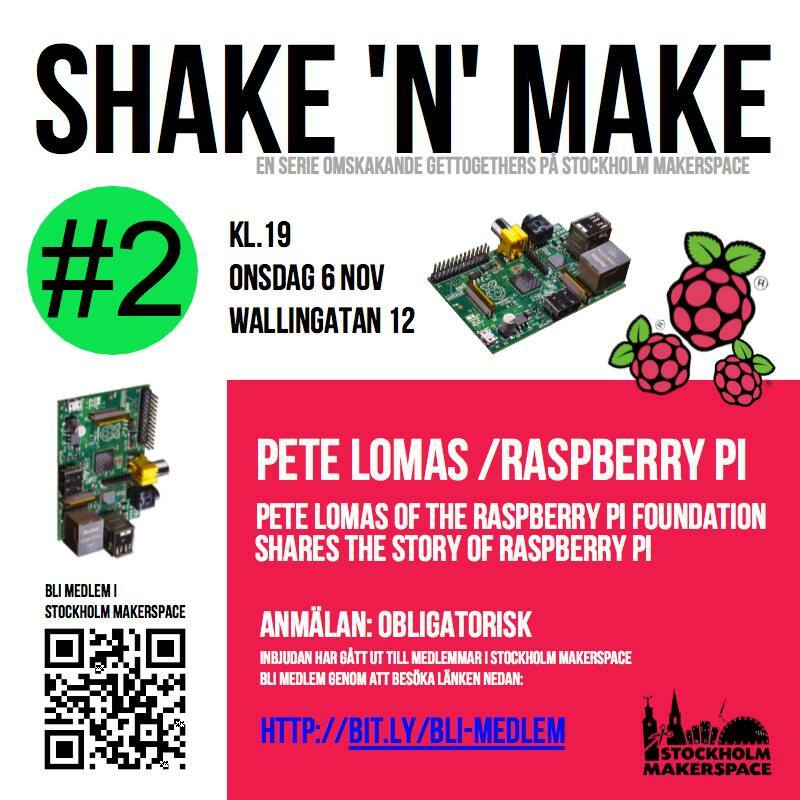 Onsdagen den 6 november är vi på Stockholm Makespace superglada över att få välkomna Pete Lomas från Raspberry Pi foundation! Kl.19 pratar han på Stockhom Makerspace och kommer då berätta om storyn bakom Raspberry Pi. ”Maker spaces are at the core of the revitalisation of creation over consumption. I’ve had the privilege with Raspberry Pi of visiting quite a few around the world over the last couple of years. Wherever I’ve been, I’ve always been impressed with the inventions that people have created: sometimes serious and practical, sometimes frivolous and just great fun! I think it is essential that we equip our children (and anyone else for that matter) with the tools and skills that give them the opportunity to become a modern-day maker. In that way we can capture their imagination and creativity in things that they had designed and built themselves, and show them that they can make changes to the environment around them to improve the way we all live. Raspberry Pi was created to provide that opportunity in the computing and electronics space. Much of the real value of Raspberry Pi has been contributed to, in large part, by makers and the ecosystem around the Raspberry Pi: there’s a huge community of makers, hackers and other contributors out there. On a daily basis they encourage, support and educate young makers to turn ideas into reality; they show kids that creative thinking can be applied to the real world. Eftersom våra lokaler tyvärr är begränsade är anmälan till denna kväll obligatorisk. Information har gått ut till medlemmar som har förtur denna kväll. Blir det platser över så släpper vi dem när det närmar sig och informerar via vår Facebook-sida.